My miter saw is the Dewalt and it has a larger footprint than the Rigid which the plans used. I did not use the Kreg filp stops as I have found that there is just too much play in them for accurate repeat cuts. The Veritas flip stops are much better. More $$$’s but worth the precision. I also did not install the shelf per the plan, as my shop vac is the beast from Rigid and would only fit without the shelf. I do like getting the vacuum out of the way and on to a 4-wheel platform….. much easier to get it around even if the saw is on top. I still have one more modification to make. I discovered that the saw could not turn past 50 degrees before it ran into to low 1 1/2” ridge on the top. I can just cut it down in the front and I’ll have access to the full range of the saw’s capacity. Didn’t see this in my mental plan modifications. Still I’m real pleased with the results. Nice build. I need to do something like that, rather than making cuts from the floor level. I have the Woodpecker Flip Stops on my table saw sled and they are pretty good, but often they have a bit too much slop for me. I think I will have to get these Veritas Stops, they look promising. Thanks for the information. I like it. I really need to to something like this. Currently working on the floor when I need to cut something. Also when weather it permitted I set up on saw horses outside the shop. I have a very small shop 164 sq ft. So I’m thinking something along these lines, with the flip up extension arms. But in addition to that I want it to have the ability to be a flip tool stand for another tool…...Any suggestion? I’ve seen some good online designs for a flip top. I don’t think it would be difficult to incorporate the wings, as they are independent of the base unit. good hard work. I have to try the same one. Len , nice job, very practical. Mind posting your modifications? I’ve got the same miter saw (and vacuum), and am likely to utilize the same mobile cart design. Here are the major modifications: OD is 33” deep, 28 1/2 wide. The wing span is 26 1/2×24 . 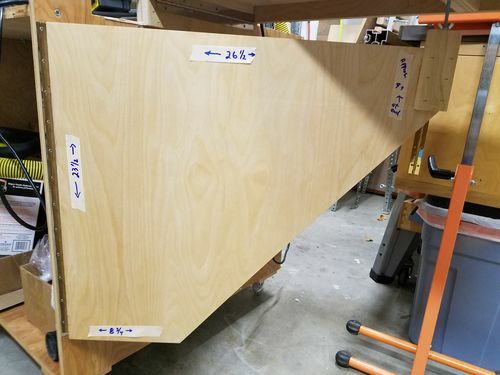 The top depending on where you mount the saw requires at least 6” on the left and 8” on the right for clearance when at using 50 & 60 degree angle cuts, so the side overhang must be removed above the top. Hope this makes sense. Thanks Len! To clarify what you said: Top and Bottom changed from the plan’s 24.75” wide to 28.5”wide. The depth changed from 23.75” deep to 28.5” deep. Looks like you can fit your entire front lever onto this platform then. You then adjusted each of the side wing’s length from 33.5” over to 26.5” and the depth from 12” to 24”. Were you able to keep this to 2 sheets of plywood? Do you find the cabinet to be sturdy enough without a shelf or front panel? I’ve been stuck in analysis paralysis on this damn thing for so long, that once I hear from you, I’m just going to go ahead and get my plywood and get to work. Thanks again for your time and experience! I did use a different method for joinery. 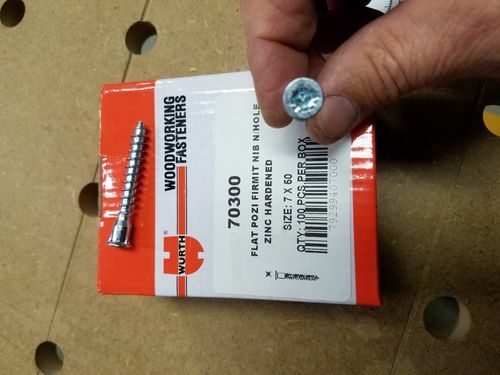 I used conformat screws … kinda like metal dowels. Not hidden like the pocket screws but much stronger. Also, I used a 4.5×4.5” x 1/2 corner brace under each wheel. Glued & stapled – gave a better base for the wheel screws to attach vs plywood only. I took a picture of the wing with dimensions for clarification. Also, the dimensions of the unit are outside dimensions not cut list sizes. You’ll need to account for material thickness. Hope this helps. Oh yea, I believe I had to buy a 3rd sheet of plywood. I have plenty of leftovers for other projects. You rock, thank you for taking the time to illustrate that. I haven’t heard of the conformat screws… will look into it. 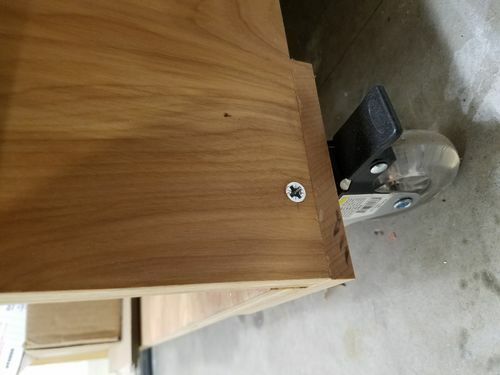 My research actually has shown me that pocket screws tend to be stronger than most wood joints utilizing the same width materials, but I figured that direct screws probably would do the job too. The dimensions make total sense now, especially utilizing 3/4” ply. Thanks again Len, I greatly appreciate it. I incorrectly typed conformat should have been confirmat. They do require a special drill bit for pre-drilling the pilot hole. Like “Snappy Confirmat Screw Two-Piece Drill Bit 7×50mm. MADE IN THE USA” found on Amazon. Good luck on your build. It’s been awhile since you posted this, but are you happy with this style saw station? I’m debating between a larger setup and a smaller setup like this. I don’t really have the space for a bigger setup but could squeeze it in if I got real creative. For my small work space, I’m very pleased with this setup. I did just upgrade the wheels to larger 4” HD locking swivel casters from Amazon for less than $35 for all 4. Now, I don’t get stuck in the crack of the garage floor when moving it in and out.